Illegal dumping is the unlawful deposit of any type of waste material that is 200 litres or more in volume (about the volume of a wheelie bin), and penalties apply. Leaving items on the footpath (outside of organised collection days) or outside a charity bin or shop is also classed as illegal dumping. Doing this costs charities and councils thousands of dollars to clean up—money that could be spent on important community services. Donating to charity is great, but please don’t let your good deed go to waste! If your items are too big to fit into a charity bin, then drop it off in-store. You can report illegal dumping online (from a vehicle/vessel), to council or by email. Waste deposits over 2,500 litres in volume attract higher penalties. A poor and uncared for environment leads to more dumping, other illegal activities and antisocial behaviour. This, in turn, can lead to reduced community pride and property values. 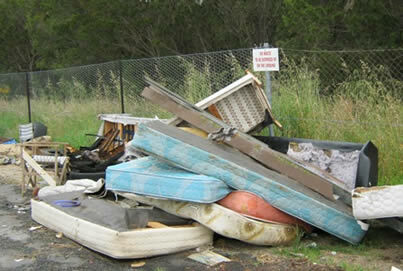 Illegal dumping costs Queensland communities millions of dollars each year in waste management and clean-up expenses. Illegal dumping of items containing chemicals or asbestos can directly cause harm or injury to humans and wildlife, and major pollution. Animals can also become entangled in dumped items leading to injury and death. Illegal dumping can also introduce pests and weeds into our natural areas, block waterways and roads, cause flooding (by blocked drains) and facilitate higher rates of erosion by smothering natural vegetation cover. Why does illegal dumping happen? because they do not want to spend the time or effort disposing of or recycling their waste properly. Offenders often go to extraordinary lengths to illegally dispose of waste and avoid detection and prosecution. Ironically, legal disposal may have cost far less in fuel, time and effort and many of the items illegally dumped such as garden waste, white goods and computers can be easily recycled. If using waste collection services, ensure you keep contact/vehicle details and ask for a copy of a tip receipt or other proof of lawful disposal to ensure your items are not just being illegally dumped! Kerbside dumping is when you place unwanted items on the kerbside outside of official kerbside collection dates—expecting that these items will be collected by passers-by or council. This behaviour is actually illegal and can carry heavy fines. It causes many issues in terms of pollution, clean-up and the degradation of communities. Find out more about kerbside dumping. Our vision is to create a Queensland free from litter and illegal dumping driven by the adoption of best practice in waste management in education. This agenda is being delivered through the Queensland’s Litter and Illegal Dumping Action Plan (PDF, 2.8MB). As part of this plan, much effort is going into building a solid foundation in raising the community’s awareness, the risk to offenders and the capacity of enforcement officers.